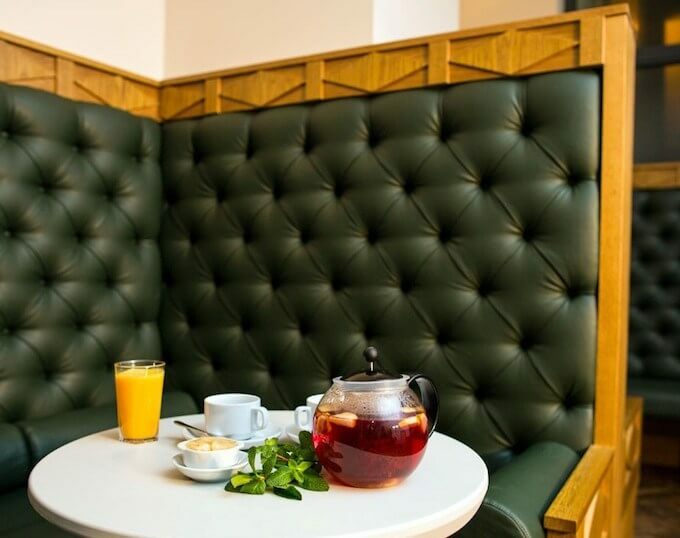 Banya No.1 is a traditional Russian spa club based in central London, offering organic spa treatments, wellness rituals and well-appointed steam and sauna facilities. Our editor, Joy Joses, went along to review, and after three hours of rejuvenating spa therapy and an unusual treatment involving being thrashed with a bouquet of leaves (! ), she is already looking forward to her next visit. With a glassed exterior and a winding glass staircase, this spa starts as it means to go on, modern and natural at the same time. At the beginning of your experience you are given a quick lowdown on what the three hours will involve, before being shown to the female changing rooms, which are clean and simple. Tip: The entire spa is wet, so be sure to bring flip flops and a bikini! However, towels will be provided. The three hours at Banya No.1 will be pleasant ones, so much so that the spa has a very impressive list of celebrity clients on their roster. “Our steam and Parenie are the reasons why the customers come back again and again. Including celebrities such as Justin Bieber, Kate Moss, Emilia Clarke, Liv Tyler… Well, what’s good enough for Justin Bieber…” (Banya No.1). First up, we spent time in the sauna, with the humidity clocking in around 60-70%, the sensation will be strange but oddly calming. After the sauna, you are advised to pull a bucket of cold water over yourself, though you will know what’s coming, it’s still a shock to your system, however you will feel alert and refreshed. So quite fittingly, Banya No.1 has the reputation of not being for “the faint-hearted.” (BBC News). Following your shockingly cold submergence, you will be asked to head to the dining area for a pleasant drink of herbal tea. 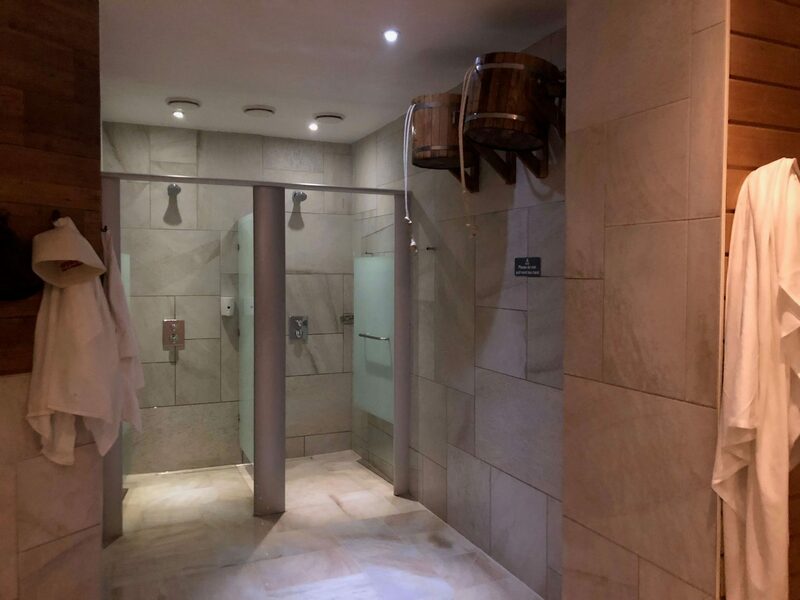 With a welcoming and comfortable atmosphere, the spa’s environment helps to restrict any self-conscious feelings that may linger as you shuffle about in your towel and flip flops. Next are the treatments. Check your modesty at the door though as the honey and salt scrub therapy requires you have this treatment in your birthday suit! 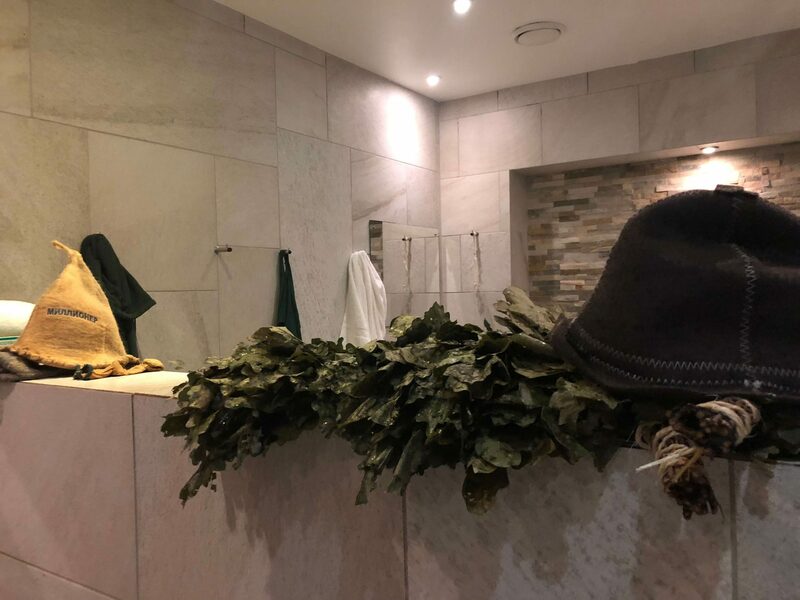 Banya No.1’s signature treatment is the Parenia, where you lay on a wooden table in the cloying heat of the sauna, placing your head on a bunch of wet Parenia leaves after putting on a funny looking hat (which we later learnt prevents the heat from going to your head)! At the point when you’ve settled down comfortably, you’ll get a gentle whooshing sensation flowing up and down your body as the attendant, a burly Russian man begins to gently thrash a bouquet of Parenia leaves all over you. Bizarre but effective! You’ll feel all the tight knots and stress that you entered the spa with begin to melt away as the attendant skillfully directs the heat to various pressure points. After 25 minutes, the next stage will involve a douse of that ghastly ice-cold bucket of water again, but trust me, after the heavy influence of the treatment’s heat, you’ll be very welcoming to the dunk! If you’re brave enough and go forward with the honey and salt scrub, expect a pleasant sensation from the smoothness of the honey and exfoliating grate of the salt, massaged gently into your body by a helpful Russian woman called Rasa. Thirty minutes later, she’ll ask you to go sit in the sauna again, presumably for this treatment to take hold. After this, you’ve guessed it! Another dunk of the cold-water bucket, but by the third drench you’ll most likely be looking forward to it, as the constant fluctuation between heat and cold will loosen your tensions and allow yourself to be thoroughly pampered. We left the spa thoroughly relaxed and rejuvenated. It must be a good experience if you are already thinking of your next visit as you leave the building!